When it comes to looking after the health of your cherished cat, its diet is often the first place to look if you feel you need to make a positive change. Your pet needs a healthy balanced diet to thrive and so what you have been feeding your cat may now be a cause of concern. And one option that is growing in popularity is to feed your feline a raw food diet. Simply put, a raw diet means you cut out all processed or dry food and replace with a raw meat-based diet that is as natural as possible. It’s a pet diet that has certainly courted some controversy, with divided opinions on both sides of the (cat) dinner table. For some, going raw is how your cat was meant to eat, whereas for others the safety of serving raw food to your pet is a significant concern. We look at exactly what a balanced raw diet entails to help you decide whether to make the move to the raw side. A raw diet means feeding your cat uncooked animal meat (including muscle and offal meat) and bones. The diet is also known as the BARF diet but before you take that as a reaction your cat may have, it actually stands for ‘bones and raw food’ or ‘biologically-appropriate raw food’. The basic rationale behind the raw diet concept is that in the wild, felines would have eaten raw meat and vegetation and so today’s domestic cat is pre-dispositioned to such a diet. On paper the raw diet does seem a natural way to feed what was once wild animal. But it is not as simple as that for domestic cats, who also require other nutrients in their diet in addition to pure protein to maintain good health. So, while the term raw diet instantly conjures up images of raw meat alone, it should also include some raw vegetation and good fatty acids as well as eggs and even dairy to create a healthier balance in a feline’s overall diet. Raw diets appeal to cat owners looking to give as natural as possible food to their pet and can either be commercially prepared or home-made. There are pros and cons to both, with bought raw diet meals a cost commitment while home-made can be time-consuming. Are Raw Diets Good For Cats? Whatever you choose to feed your cat must provide all the necessary nutrients he or she needs for optimum health and vitality. And your cat has most likely already shown you it has a real taste for raw, when it brings you ‘gifts’ from the garden. Like humans, cats thrive on tasty food, so something that tastes nice and is also good for them health-wise has to be a good thing. And that is the key to the right raw diet for your cat, it has to provide all the nutrients your pet needs for it to be good for them. There are some scientific concerns about the actual benefits of a raw diet for both cats and dogs, including the physical impact on domestic animals when there is a nutritional deficiency due to an imbalanced diet. When moving their cat over to a raw food diet, many pet owners often don’t consider the need to make sure it’s actually complete and balanced. To feed your cat just raw meat without considering the overall calorie, fat, protein and additional nutrient content could lead to ill-health and poor condition in the long run. But providing your cat with a well-balanced raw diet could bring positive results, helping to ensure your pet remains happy and healthy. Guidance from your vet or a veterinary nutritionist may be useful, so you can be sure it’s the right diet move for your pet. Depending on your cat and any existing health conditions, your vet may also recommend additional supplements. 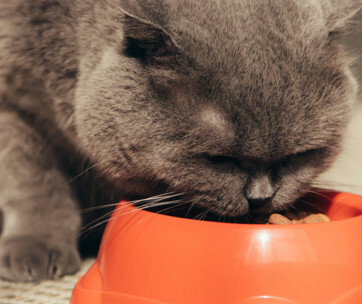 Is It Actually Safe To Feed My Cat A Raw Diet? Have you ever wondered how your cat can eat something it’s found in the garden but shows no ill-effects? Cats have a digestive system that is much better at digesting raw foods than humans and, thanks its acidic digestive tract, can cope with most pathogens and nasties without falling ill. However, not all domestic cats can actually tolerate raw food. For this reason, if you’re looking to move your pet over to a raw diet, you need to do it slowly so you can see how well – not – your cat responds. The other main danger of a raw diet is not actually to cats but to their humans, who will be handling the raw meat and could be at risk of cross-contamination. Extra care has to be taken in preparing a raw diet in the home, even if it’s just opening a bought packet. And experts recommend that it should not be fed to a cat in a home where there are elderly, very young children or individuals who have a compromised immune system. Other risks associated with a raw diet are the potential health implications for your cat if the diet is not sufficiently balanced as well as a possible choking risk on small bones, if they have not been ground up properly. Why Should I Consider It For My Cat? There’s no denying even the sweetest of lap cats are committed carnivores, and they need the protein and nutrients found in meat to survive. 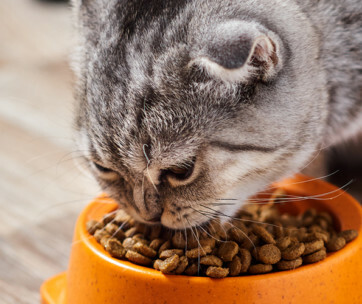 It can be argued that the commercial processing that’s needed to create tinned cat food or dry kibble reduces the amount of these natural nutrients, which are more readily found in raw meat, including taurine, fatty acids and essential minerals. These nutrients play a key role in your cat’s overall health, including the condition of their coat, the strength of their teeth and their resilience to illness. You could consider a raw diet for your cat if you’re concerned about their overall health, they have become a fussy eater, have developed a weight issue or you want to have more control over the quality and source of their food. If you’re looking to introduce your cat to a raw diet, however, it’s recommended you discuss it with your veterinary practitioner first to ensure it is the right move for your pet. As a basic guide, there are four main elements to a balanced and complete raw diet for your cat – meat muscle, organs, bone (or ground bone) and some vegetation. Additional natural supplements such as a source of calcium can also be added. Rabbit, poultry and fish are considered to be the best source of protein for cats while green vegetation such as broccoli, celery or spinach are highlighted. Apples and eggs can also be good additions to the raw food mix. When choosing a commercial raw food, make sure you check the credentials before you buy. If the product comes with a stamp from the Association of American Feed Control Officials (AAFCO), then it has been certified to provide a complete and balanced nutrition. Commercial raw food products have also usually been freeze-dried or frozen to reduce any pathogens but should still be handled with care when preparing a meal for your cat. Preparing your own raw food at home can be time-consuming and you need to be extra vigilant when it comes to potential cross-contamination. If this is a significant concern or is not appropriate for your home, but you still want more natural diet for your cat, consider home-cooked cat food. The recipe must still be nutritionally balanced but can be a good alternative for both you and your feline pet. What About My Kitten Or Senior Cat? When it comes to the age of your feline, there are some important considerations to be taken into account before you decide whether it’s right to introduce them to a raw diet or not. Young kittens should not be fed raw meat until they are happily weaned from their mother at around the six-month mark. This is to let their digestive system mature enough to be able to take such a pure meat diet. The overall advice is to feed kittens home-cooked meat or canned food until this time and then try them slowly on a full raw diet. The meat must also be extremely fresh to reduce any risk to the young cat. The decision to feed such young animals a raw diet needs to be carefully thought through to ensure it is sufficiently balanced otherwise it could interfere with their growth and development. Veterinary advice is strongly recommended. The same caution should also be exercised when it comes to senior cats (10 years plus). With the high protein content, a raw diet can actually be harmful to old cats, who may already have a health condition. Raw diets are not appropriate for an animal with kidney or liver disease. Once again, speak to your vet about your elderly cat’s health before you switch to raw. If you have made the decision to move your cat over to a raw diet, then it needs to be taken slowly, in order to ease their system into a new way of eating and digesting. This transition should take around 7-10 days, with a gradual introduction of more raw food into their diet until their old food has phased out. Then just continue to feed your cat the same amounts and at their usual times for consistency. This gradual introduction will help reduce wind and gives their gut flora and digestive enzymes time to adjust to the new pure, raw food. Includes higher levels of the amino acid taurine – which cats need for a healthy immune system – than in processed tinned cat food and dry kibble. 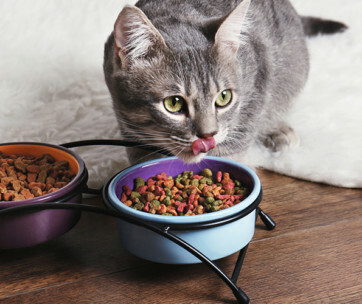 If your cat is a picky eater, he may well struggle to adapt to a new raw food diet.